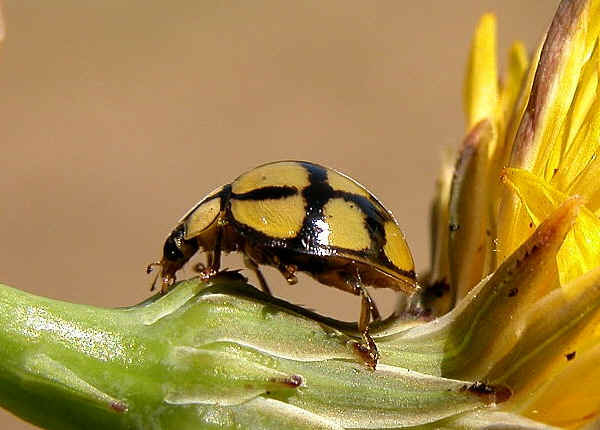 The beetle is lemon-yellow in colour, with black lines on its wing-covers resembling network pattern. 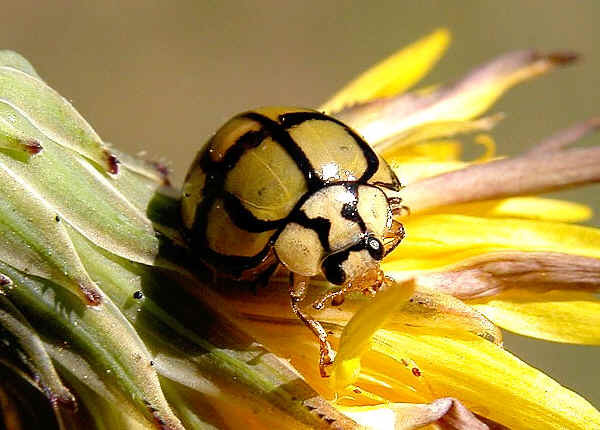 So we call this beetle Netty Ladybird. We found this ladybird only once in Brisbane. We search around the internet, the only thing we found was a beetle on a Singapore Stamp which look similar to this ladybird (see the reference below). 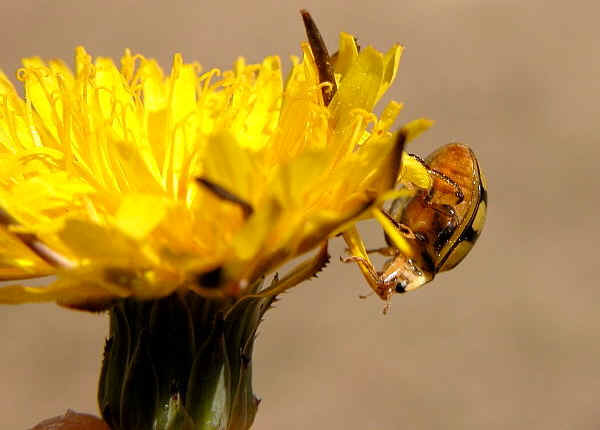 We asked Dr Adam Slipinski and he kindly replied that "It is a Harmonia testudinaria (Mulsant). It is not common in the Queensland south but more frequently found around Cairns and further north. It extends to PNG and part of Indonesia. The reticulate colour pattern is a very common and misleading one in many Coccinellini occurring in PNG/insular Oriental Region making them hard to distinguish externally while in reality there are 6-7 genera and many species that look very much alike. Fortunately H. testudinaria is the only species of that complex in Australia." Here we would like to thank Dr Adam Slipinski again for the information. On September, we found some ladybird pupas on a pine tree. We took a few of them home. 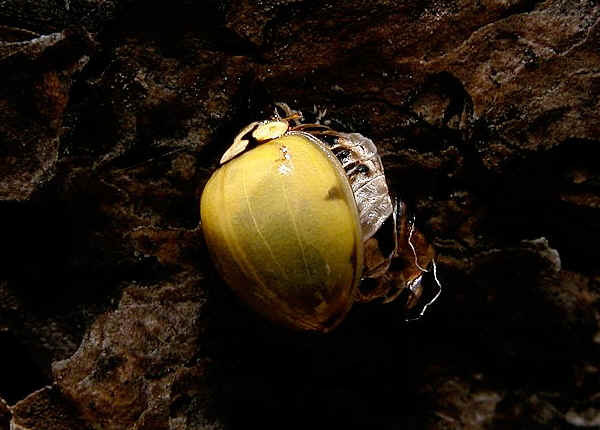 One day later, the ladybirds emerged from those pupa. 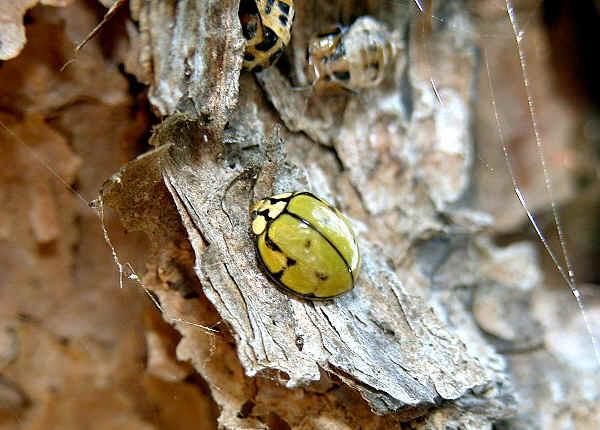 We never saw those ladybirds before. The above left picture shows a ladybird just came out from pupa. Its colour patterns were not appear yet. Its hindwings were extended to dry and harden in the air. The right picture were taken one day later. 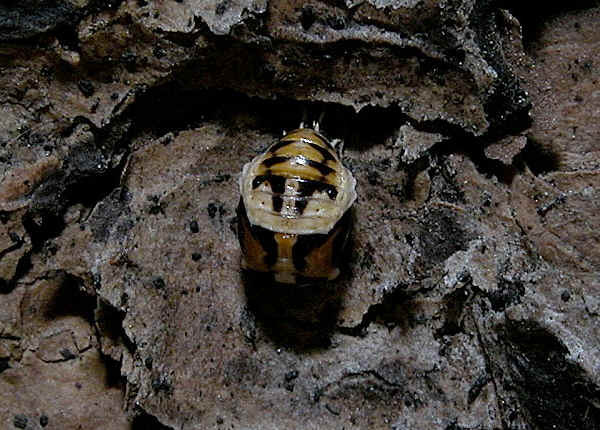 All pupas turned into adults after one or two days. The beetles were slow moving. We took the above pictures in our backyard. We released them back onto the pine tree a week later. 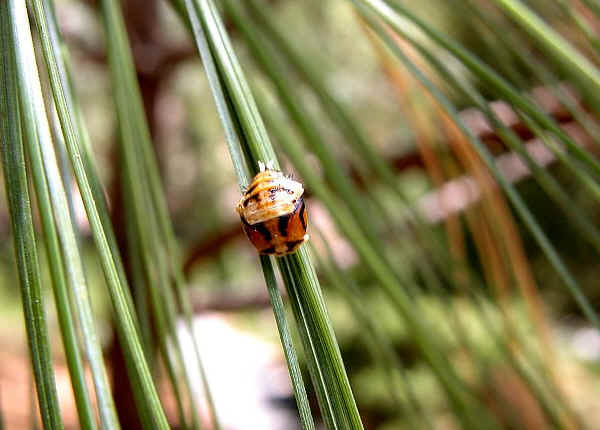 We could not find any information about this ladybird so we decided to go back to the pine tree to check again. 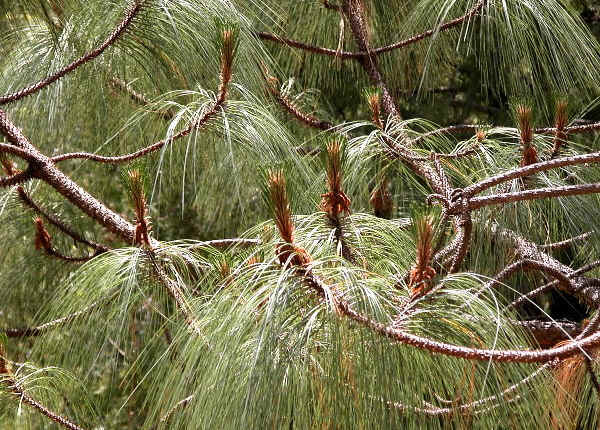 The pine tree was in Brisbane Botanic Garden. We found more ladybird pupas on the tree trunk and main branches of a pine tree. There were a few pupated on pine leaves. Amount those pupas, some ladybirds were emerging. 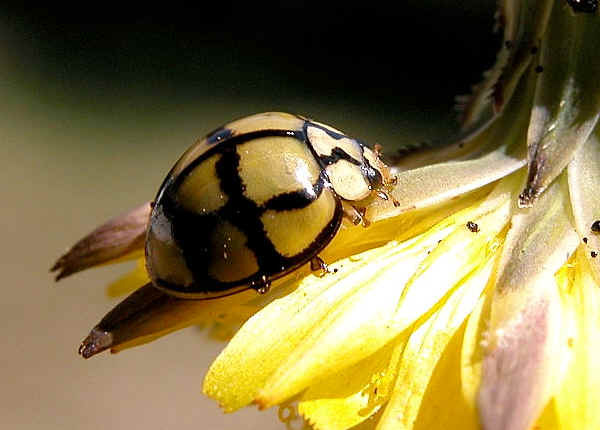 When the ladybird just comes out from pupa, its wing cover is pale yellow in colour. It becomes bright lemon-yellow with black lines one day later. We did not found any ladybird larvae except one. It was about to turn into a pupa. 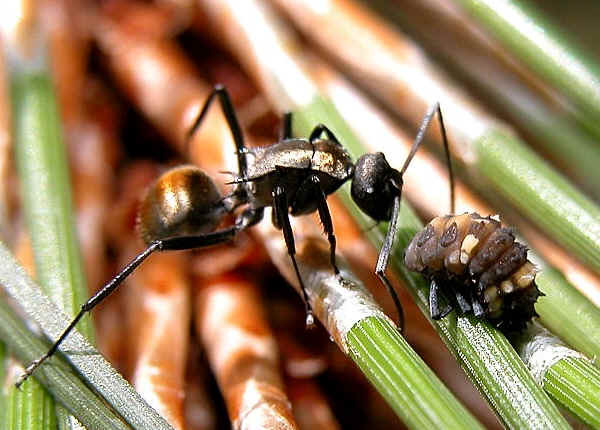 When we were taking the photos, an ant came to inspect the larvae. The ant found nothing interesting and walked away. We bring the larvae home, it turn into pupa a day later. The pupa was the same, except a bit smaller than the others. 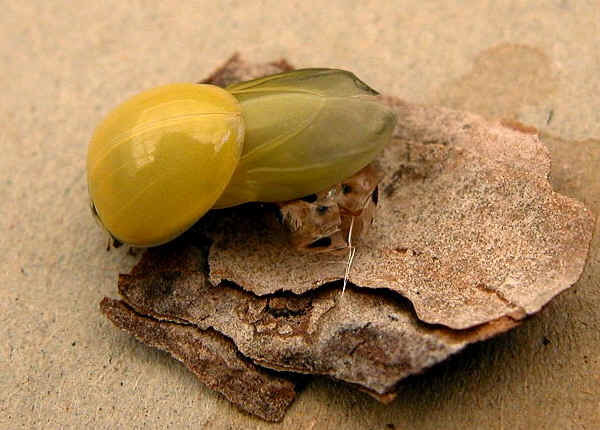 The pupa turn into adult three days later. On a main branch near those pupas we found a group of empty insect egg cases. We were not sure if they were ladybird egg cases. 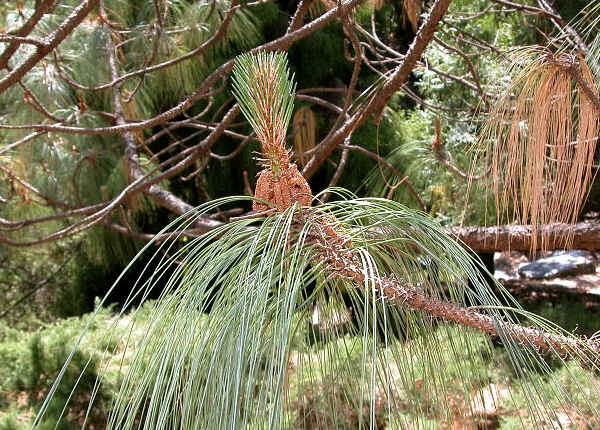 From the name plate on the ground, the pine tree was Montezumae Pine (Pinus montezumae), which is original from Mexico. 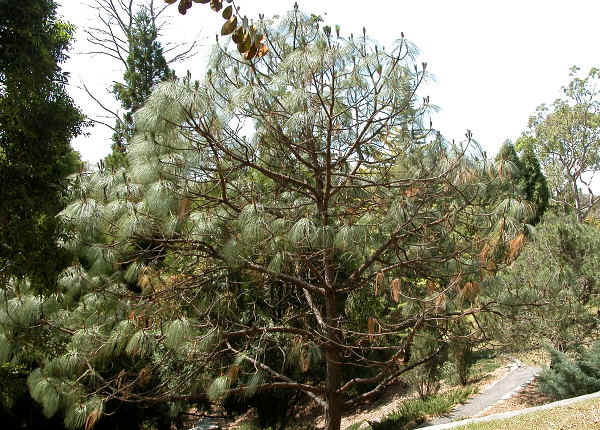 There were many pine trees planted in that area of the Botanic Garden. All those pine trees are different species. We carefully inspected those pine trees near by but we could not find any. The ladybird pupas were only found on this tree. 1. Insect Stamp of Singapore - Insects on Stamps. Last updated: October 18, 2005.